Camber kits prolong tire life & improve handling. 1. Better handling. The lower center of gravity reduces body roll during hard cornering, keeping the car more stable in the turns. 2. Better appearance. The “un-cool” gap between the top of the tire and the fender is reduced, giving the car a sharper, ground-hugging appearance. A sport suspension will also give you a firmer ride than a stock suspension. This firmer ride provides more direct feedback about road conditions and improves safety and traction by helping the tires maintain better contact with the road surface. Just how much firmer the ride is depends on the springs you choose. Some brands – most notably those developed for the racetrack – are notoriously harsh. (We don’t sell those brands.) Other brands, such as our Bavarian Autosport performance springs, are designed specifically for spirited street driving and offer a ride that is much closer to stock while still providing the aforementioned benefits of better handling and a sharper appearance. 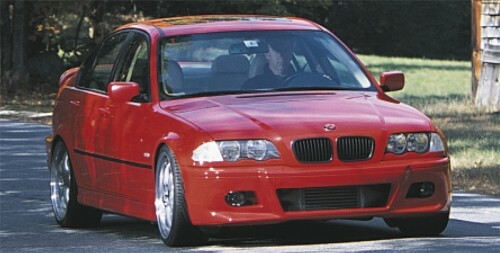 No matter which brand of springs you choose, lowering your BMW will alter the camber and caster of the wheels. While this improves the handling and turn-in of your BMW, it can also cause uneven tire wear, resulting in reduced traction and less-than-optimal straight line tracking. However, if you combine lowering springs with an adjustable camber kit, you can improve your BMW’s handling and straight-line tracking AND slow the wear on your tires. 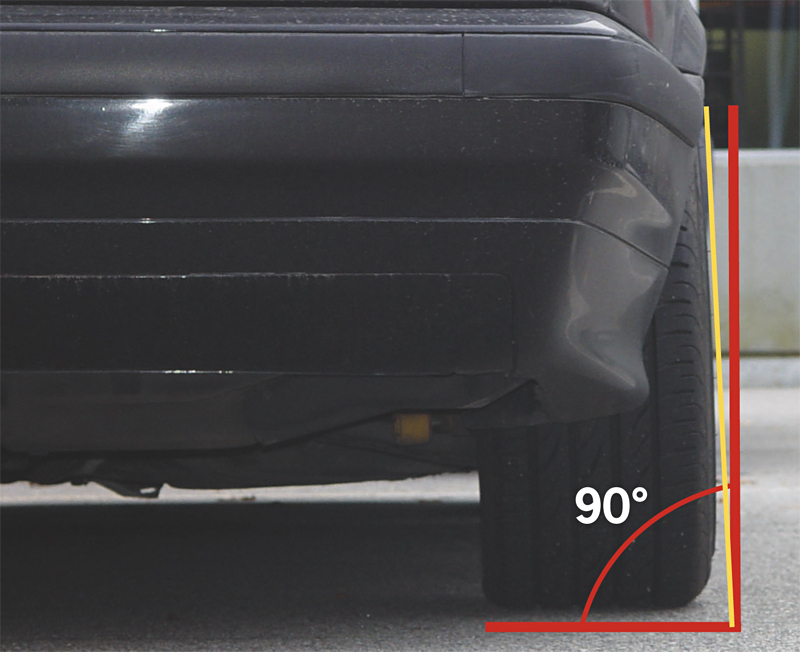 Simply put, camber is the angle of the wheel, top to bottom, when viewed from the front or rear of the vehicle. Camber is measured in degrees, with vertical being 0-degrees. Positive camber (e.g. +3°) means the top of the wheel is tilted away from the car (at a 3-degree angle). 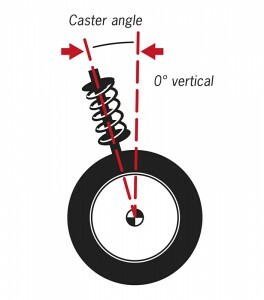 If the top of the wheel is leaning in towards the car, the camber is a negative (see photo below). Most high performance cars such as BMWs come with some negative camber for better handling. People who race their BMWs at the track like even more negative camber. But excessive negative camber will result in less-than optimal straight-line tracking and faster wear of the tire tread. (And with the price of high-performance tires these days, that can add up to a major expense in a hurry.) Both front and rear tires are susceptible to uneven wear caused by excessive camber. That wear is even more pronounced on BMWs with “plus-size” wheels and tires. 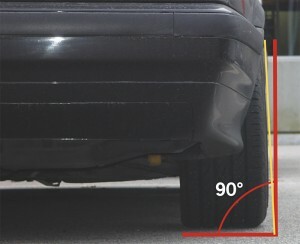 Caster, which is also measured in degrees, is essentially the angle between 0° vertical and the inclination of the strut when viewed from the side of the car (see below). If the strut is tilted toward the front of the car, the caster is negative. If the strut is tilted toward the rear, you have positive caster. An improper caster angle can make the steering feel light if the angle is too negative, or heavy if it is too positive. Properly adjusted caster allows improved high-speed directional stability, better steering response, quicker turn-in, reduced “dive” on braking and reduced “lift” on acceleration. 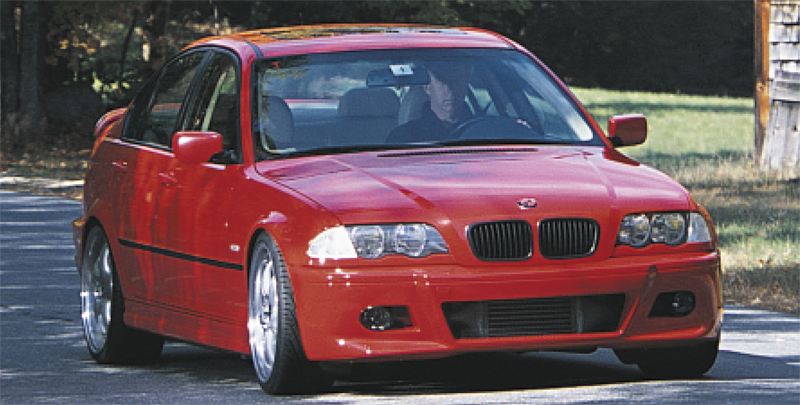 Most BMWs were not designed to allow enthusiasts to make camber and caster adjustments. But you can make adjustments if you install our adjustable camber kits (below). They allow you to set camber and caster at the optimal positions for better handling and reduced tire wear. Plus, you can adjust the front kits from under the hood. This lets you drive your BMW to the track with street settings, adjust the front wheels for racing, then change back to the street settings before you drive home – all without jacking up the car! Our adjustable camber kits are available for most BMWs and the new Mini. Installation of the front kits is a bolt-on procedure that is comparable to installing new shocks (they replace the upper strut mounts). Most rear camber kits replace various rear suspension pivot bushings (specific bushings depend on the model) and many allow increased camber as well as toe adjustments. The cost of the camber kits is about the same as a new pair of tires, so depending on how long you own your BMW, they can pay for themselves several times over. 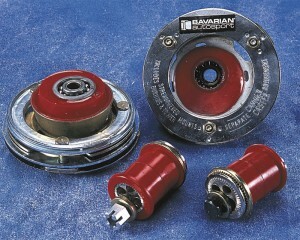 Bavarian Autosport’s adjustable camber kits are made for us by the experienced engineers at K-MAC. These folks have been researching, designing, race-testing and manufacturing suspension upgrades since 1964. In the early 1970s, K-MAC saw the need for bolt-on, adjustable camber and caster kits – both front and rear – to satisfy the demands of enthusiasts (like us) who wanted improved handling but were frustrated by premature tire wear problems on lowered cars, especially BMWs that have been upgraded with “plus-size” wheels and tires. With the development of these kits, K-MAC set new standards for ease of installation and adjustment. So when we were looking for a company that could supply adjustable camber kits to BMW enthusiasts, K-MAC was the obvious choice. Our front adjustable camber kits replace the upper strut mounts in your BMW and allow separate camber and caster adjustments. They feature a patented ratchet system that lets you make the adjustments under the hood, with the vehicle under load. No need to jack your BMW up – just loosen the strut tower mount nuts and adjust. Rear kits replace the stock rear trailing arm or control arm bushings and allow adjustment of camber and toe (on most models). Both front and rear kits offer greater range of adjustment than other kits on the market. The values shown below ARE NOT the BMW factory suggested values. The outlined values are intended to optimize the tire wear for street driving, while not negatively impacting other handling characteristics of the vehicle under normal street use and moderate street-performance driving. These values would not be used for a vehicle that sees track driving ….. or “real” track-style driving. Camber – 1/4 to 1/2 degree negative (both front and rear). Note that if the car is lowered, you may not be able to get to these values, even with an aftermarket camber adjustment kit. In these cases, just get as close as you can and know that you are better off than if you did not have the additional adjustment that the kit is providing. Caster – Factory suggested value (front only). If you cannot achieve the factory value without negatively affecting the desired camber value (as noted above), it is fine to allow a higher positive caster value. For example, if the factory value is 5 degrees positive, but you must have 6 degrees positive in order to achieve the desired camber, this is fine and will have no negative affects on the driving or handling. If fact the car may feel a bit more stable on the highway. Toe - Rear, 0.1 degree toe-in per side (0.2 degree inclusive), Front, 0.05 to 0.1 degree toe-in per side – The toe is very important for both tire wear and handling. These settings will promote good tire wear and will also not negatively affect the vehicle stability or handling. If the desired toe-in, at the rear, cannot be achieved without adding negative camber, you will need to change the rear camber (add negative if necessary) in order to achieve the toe setting. I am the owner of a 740il with negative caster’ angle the degree I am not sure of, but definately not out of the visual norm’ seeing I have owned 6 BMW’s and somewhat familiar with these vehicles, (ook into mech for alignment check) he states needed new rear control arm bushings!….yet I had NO rattle or sounds associated with worn bushings…. ? Opinoion would be greatly appreciated. The E38 7-series (95-01), E39 5-series (97-03), E53 X5 (00-06) and most of the later model 5,6,7 and X series BMWs use a similar rear suspension design. The two upper control arms (or links) that are on each side have bushings on the inboard end and ball-joints at the outboard ends. We are finding that the inboard bushings are a common culprit in excessive negative camber on these models. the bushings get soft and allow the arms to push toward the center of the vehicle …. increasing negative camber. We do keep all of these arms in-stock. Just visit our online store at http://www.bavauto.com or call our agents at 800-535-2002.